The above info came from Chandler, and was edited by yours truly (contact me). The image came from Amazon.com. 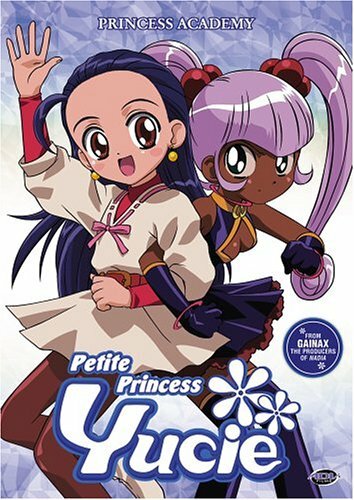 Puchi Puri Yusshi is a cute little Magical Girl Show that tells the story of not one, but six Magical Princesses, each of which is from a different world. For example, Gurenda is Princess of the Demon World, with "elegant beauty and FANTASTIC magical powers." Also, all the girls seem to be stuck at the age of ten, when they're all really seventeen! Weird, la? Anyway, the story starts out with a war brewing between the humans and the demons. A man named Gunbard is fighting with one of the demons when he realizes a bright light falling from the sky. Like the caring guy he is, Gunbard goes to see what the light was. He gets to the spot where it fell to Earth, and expects probably a brain-eating alien, but instead gets...a bouncing, baby girl! He names her Yusshi and takes her in as his own daughter. On Yusshi's 17th birthday, we see that she still has the body of a ten year-old...and she obviously gets teased for it by the older girls in town. That very night, Yusshi learns of the Eternal Tiara from Drago-sama, which can grant any wish of its wearer. So she decides to search for it, and wish to become an adult so that she can at least have a chance at marrying the Prince of Ercell (who actually saved her when they were younger). Ironically enough, her search leads her to the castle where she must go to the highest room of the tallest tower. She somehow wriggles her way past the stupid guards and into the Sacred Chamber, were the tiara is being kept. Just as she is about to take it from the altar, Queen Ercell calls out for her to stop. Yusshi is completely startled and does as she's told. The queen demands to know her name, which is Yusshi Gunbard. For some reason the queen seems excited to hear that she's Gunbard's daughter, and then acknowledges her as an official Platina Princess Candidate! Now she must compete with the other four Platina Candidates for the tiara: Gurenda Princess of the Demon World, Erumina Princess of the Heavens, Beth Princess of the Fairy World, and Kokoru Princess of the Spirit World. The above description came from Kiki Jackson, and was edited by yours truly (contact me).